Kausalyaganga: A training programme on “Freshwater Aquaculture” for Tribal Farmers of Junnar and Ambegaon Tahsils of Pune District, Maharashtra State” is organized by ICAR-CIFA, Bhubaneswar under its TSP programme during 25-28 March, 2017. Total 30 tribal farmers from Junnar and Ambegaon Tahsils of Pune District, Maharashtra State participating in the training programme. The Inaugural Function was conducted on 25 March, 2017. In the Inaugural Function, Dr. B.C. Mohapatra, Chairman of TSP and Principal Scientist, ICAR-CIFA, Bhubaneswar welcomed the participants and highlighted the success stories of fish production from ponds from different parts of India under Tribal Sub-Plan (TSP) of the institute. He also emphasized the use of water resources for effective utilization of aquaculture and therby increasing livelihood of tribal farmers. He mentioned the use of portable FRP carp hatchery technology, which has changed the scenario of carp seed production across the country. Those carp seed could be reared to fingerlings stage for reservoir stocking. Dr. J.K. Sundaray, Director, ICAR-CIFA emphasized the need for improvement of livelihood of tribal farmers through aquaculture practices with proper training and skill development. He appriciated the response from Fisheries Department, Govt. of Maharashtra and their effort for development of aquaculture in the state with the help of ICAR-CIFA. He urged farmers to use acquired skills in effective way to utilize the untapped natural resources for scientific fish culture and livelihood development of the tribal community. The Programme was inaugurated by Dr. Rekha Das, Director, Vocational Training, Gov. of Odisha as the Chief Guest. She appreciated the role and efforts of ICAR-CIFA for the farming community of the country for their livelihood development. She emphazied and motivated farmers to take this training and skills for upliftment livelihood using aquaculture practices. 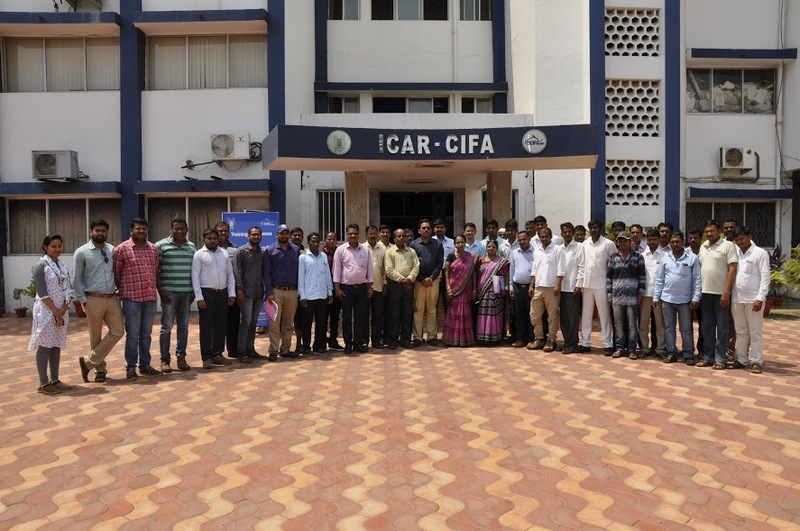 The training programme was co-ordinated by Dr. Suhas P. Kamble, Mr. Pankaj A. Patil, Mr. Avinash R. Rasal, Mr. Mohan Bade & Mr. Kiran D. Rasal, Scientists of ICAR-CIFA. Dr. Suhas P. Kamble proposed the vote of thanks.